One of the services that we offer that unfortunately is growing in popularity is Japanese knotweed control. This aggressive plant has taken hold in the British countryside and is the bane of many a homeowner’s life. But what is it, and why is it so different from other weeds? Japanese Knotweed is officially known and the UKs most invasive and destructive plant. If left unchecked it can grow through tarmac and can creep under houses and push up through the floorboards. It is such a problem in the UK that this weed control is costing the UK Government thousands of pounds each year. Although this plant does produce seeds, it doesn’t germinate this way. The most common way of it spreading is through its shoot like roots, which will produce new canes whenever they come into contact with soil and water. 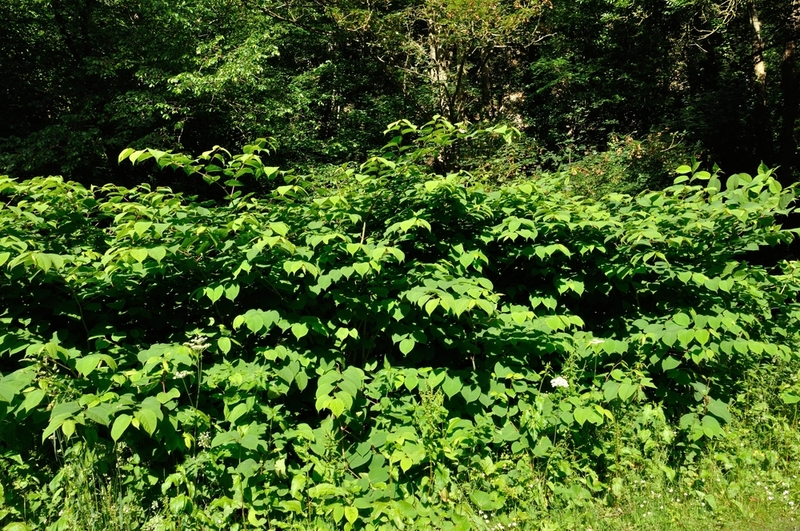 Knotweed is such a problem in the UK, that there are actually two pieces of legislation governing it – which you need to know about if you have it in your garden. The first is The Wildlife and Country Act of 1981 which states that ‘it is an offence to plant or let Japanese Knotweed grow in the wild’. An offence under this Act can result in a prosecution. The Environmental Protection Act of 1990 also states that the weed is classed as ‘controlled waste’ which means that by law you have to dispose of it at a licensed landfill site. A violation of this Act can result in quite a hefty fine. You can also be held liable for the cost of any Knotweed that spreads to neighbouring properties as well. Leaves – Bright green in the shape of a shovel. It grows fastest in Spring when new shoots suddenly appear from the crown buds, and in late spring the stems can reach up to 3 metres tall. In summer the leaves will start to appear and then in late summer, the white flowers should come out. These then die off, leaving just the leaves and brown stems in Autumn, and the leaves will then fall off in Winter. Japanese Knotweed can be really tricky to get rid of, especially if you have never dealt with it before. Leaving even the smallest trace of the plant will mean that it regenerates and grows again – so it is not as simple as digging it up, or even treating it with chemicals.